SAN LUIS OBISPO, Calif. (BRAIN) — A trio of employees has purchased brick-and-mortar and online retailer Art's Cyclery and has wound down the e-commerce business in favor of focusing on local customers at its new location on California's Central Coast. CHINO, Calif. (BRAIN) — A GoFundMe campaign has been established to help with the medical expenses of InCycle Bicycles store manager Megan Rodriguez, who was run over by a pickup truck attempting to stop thieves from making off with a high-end bike this week. 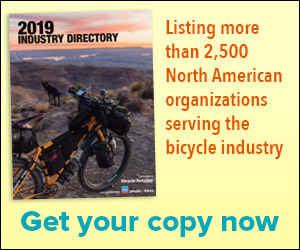 BROOKLYN, N.Y. (BRAIN) — By the end of the year, Brooklyn, New York, online and brick-and-mortar retailer R&A Cycles plans to open a new 10,000-square-foot store in Northern California’s East Bay Area. CHICAGO (BRAIN) — A spate of at least 10 early-morning smash-and-grab break-ins over the past three weeks at bike shops in and around Chicago has spurred area retailers to rethink their security measures. BERKELEY, Calif. (BRAIN) — After seven years leading the National Interscholastic Cycling Association (NICA), Austin McInerny is stepping down as president.